Tamilnadu Public Service Commission has published the official notification for the new Combined Civil Service Exam - CCSE IV for both Group IV and VAO posts. The detailed notification is published in the TNPSC's Official website given below. To apply for TNPSC VAO Examination, a candidate must have completed SSLC / 10th Public Examination as on notification date. Note : The VAO Exam applicants, who have Higher Education Qualification with out passing SSLC Exam are not eligible to apply for VAO Exam. For example, if you have completed M.A degree in open university mode with out passing SSLC exam, you are not eligible to apply for VAO Examination. Knowledge of Tamil : Since, Village Administrative Officers (VAO) have to work with people of Tamilnadu , to apply for Tamilnadu TNPSC Village Administrative Officer Examination, candidates should have adequate knowledge of Tamil Language. According to Government Order MS.NO.145, Personnel and Administrative (S) Department , Government of Tamilnadu, dated 30-09-2010, the candidates studied the prescribed qualification (for VAO Examination, prescribed qualification is SSLC) in Tamil Medium will be provided 20 % Reservation in the total number of vacancies. 20-07-2017 : Dinamalar News about VAO Exam Notification. It is said in the Dinamalar news that TNPSC has to receive Village Administrative Officer posts vacancy details from some more Districts. After getting the vacancy details of all districts only, the official notification for Village Administrative Officer Exam 2017 will be published. The news says that the TNPSC Village Administrative Officer Exam 2017 notification may be published in the month of August 2017 and the Examination may be conducted in the month of October 2017. It is noted that, there is no official communication from Tamilnadu Public Service Commission regarding the delay in VAO Exam 2017 Notification. So, the announcement for the Village Administrative Officer Exam may be published by the TNPSC at any time. So, be prepared for the upcoming Village Administrative Officer Examination 2017. All the best ! As per the TNPSC Annual Planner 2017 published on 1st February 2017, VAO Exam 2017 Notification date is expected to be published by the Tamilnadu Public Service Commission in the first week of June 2017 and the VAO Examination for the year 2017 is tentatively scheduled to be conducted on 17th September 2017. The tentative total number of vacancies in the upcoming vao exam 2017 notification will be about 494. Though the vacancies for village administrative officers mentioned in the TNPSC official annual planner 2017 is less in number, it is tentative only, more number of vacancies may be added in the upcoming Village Officer Exam 2017 Notification. You may check TNPSC Official Website for Latest Notifications http://www.tnpsc.gov.in/latest-notification.html . So, dear aspirants, don't waste your precious time, start your sincere preparation for VAO Exam 2017 from today itself. All the best. TNPSC VAO ( Exam Date : 28.02.2016) Phase - II Counselling Schedule Published in the TNPSC Website tnpsc.gov.in Counselling Date - 19-05-2017. TNPSC VAO Examination Second Phase Certificate Verification is going to be conducted on 13.03.2017, 14.03.2017 and 15.03.2017 at 10.00 AM at the TNPSC Office, Chennai. TNPSC Village Officer Examination (28-02-2016) Certificate Verification dates have been published in the Tamilnadu Public Service Commission's official website www.tnpsc.gov.in. The VAO Exam Certificate verification for the selected candidates whose names are listed in the commission's website is scheduled to be conducted from 1st August 2016 to 8th August 2016. To download detailed schedule of counselling, please visit TNPSC official counselling website from the below link. If the details given by the candidates is found wrong during the VAO Certificate verification process at the TNPSC Office, they will not be permitted for attending VAO Exam counselling. If a candidate fails to attend for the Certificate Verification on the mentioned date , they won't be provided another chance for attending Certificate Verification. Congratulations to all the candidates got selected for first phase of CV ! What to do if you don't know your VAO Register Number ? TNPSC Village Administrative Officer Exam Question Paper will have 200 Numbers of Objective Type Questions for 300 Marks (1.5 mark for each correct answers) (No negative marks). How to Apply for TNPSC VAO Exam ? Earlier, a Village Administrative Officer (VAO) in Tamilnadu Revenue Department used to get promotion as Assistant in Revenue Department after completing 10 years service and 10 % of the total Assistant Posts Vacancies in a particular year. What is the new Change in the Village Administrative Officer Promotion ? Now the total experience period to get promotion is reduced from 10 years to 6 years. So , if you are selected in TNPSC VAO Exam, you may get promoted as Assistant with in 6 years. It is really a happy news for all Village Administrative Officers Exam aspirants and existing Village Officers who are already in the service. The Village Officer Exam is a non interview post exam, which has written examination and certificate verification only, there is no interview or oral test. So, if a candidate gets very good score in the written examination he/she can choose the districts where he/she willing to work. After completion of 6 years as Village Administrative Officer and passing a Departmental Exam, a candidate can get Assistant Post in Revenue Department ---> Revenue Inspector ----> Deputy Thasildar -----> Thasildar ----> Deputy Collector etc. TNPSC VAO EXAM SYLLABUS - DOWNLOAD LATEST SYLLABUS FROM TNPSC WEBSITE. Both Tamil and English Syllabus are available. TNPSC Annual Planner 2016 - 2017 says that the TNPSC VAO Result of the 28.02.2016 Examination will be published in the second week of June 2016. Following that the VAO Exam 2016 Certificate Verification also tentatively scheduled to be conducted in the first week of July 2016 . Final Counselling for the TNPSC VAO 2016 is expected to be started in the first week of August 2016. Dear TNPSC VAO Exam aspirants, TNPSC has already published Group 2A 2016 and Group 1 Mains Examination Results recently, the next result important notification is expected to be the result of TNPSC VAO Exam 2016. TNPSC Chairman also informed on 4th June 2016 that the TNPSC VAO Exam Result and other pending exams results also will be published soon. As he stated, TNPSC has already published the result of TNPSC Group 2 Prelims and Group 1 Mains. The next most awaited exam result from TNPSC is for tnpsc vao exam 2016. So we can expect the Village Administrative Officer Exam 2016 Result at any time. All the best ! TNPSC VAO Exam 2016 Official Answerkeys are published in the TNPSC Official Website www.tnpsc.gov.in . Download and check your score. All the best ! What is the expected cut off mark for VAO Exam 2016 ? What is the Expected Cut Off for TNPSC VAO 2016 Exam ? Click here to see TNPSC VAO Expected Cutoff Marks by www.tnpscportal.in and other popular coaching centres. 27-02-2016 : Changes expected in upcoming TNPSC VAO Exam 2016 Question Paper Pattern - Dinamalar News Today.Usually, there will be four type of question papers sets like A, B, C, D in all TNPSC Objective Type Examinations. TNPSC will introduce Serial Number based different question sets from this TNPSC VAO Exam 2016 onward. According to this new pattern, if there are 20 people in an examination hall, all people in the hall will have unique set of question paper sets. Moreover, for this VAO Exam 2016, there will be an official appointed by TNPSC in each VAO Examination centre. Dear aspirants, hope you have completed studying TNPSC VAO 2016 Syllabus portions , if you have completed the entire syllabus, start your sincere revisions from today. Now have a look into the TNPSC previous year VAO Question papers and practice as much as model question papers as possible. Study TNPSC VAO Exam materials and model question papers published in Dinathanthi, Dinamalar and Dinamani Newspapers. Practice as many as model tests as possible. All the best ! What TNPSC Annual Planner 2016 - 2017 tells about TNPSC VAO Exam 2016 Result Date ? According to TNPSC Annual Planner 2016 -2017, the TNPSC VAO 2016 Result is tentatively scheduled to be published in the 2nd week of June 2016. And the TNPSC VAO Exam 2016 Certificate Verification is expected to be conducted in the first week of July and Counselling is expected to be conducted in August 2016. If you perform well in the TNPSC VAO Exam 2016, it is sure that you will become a Village Officer with in August 2016. Plan your time effectively and study hard. All the best ! 30-01-2016 : Total number of Candidates applied for TNPSC VAO Exam 2016 is 10 lakhs. The Village Administrative Officer Exam 2016 is scheduled to be conducted on 28th February 2016 for total 813 vacancies. Now the TNPSC has provided online facility to check up the status of online application for the Village Administrative Officer Exam 2016. Candidates can check their online application status from the TNPSC Official website. The Hall Ticket is expected to be published in the second or third week of February 2016. 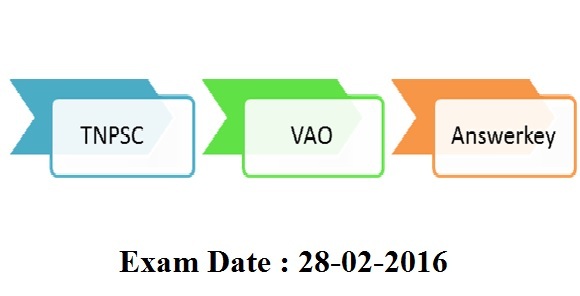 TNPSC has given online facility to check application status for the VAO Exam February 2016. Candidates can log on TNPSC Official Website http://tnpscexams.net/ to check their TNPSC VAO Exam 28th February 2016 Exam Application status. TNPSC VAO Exam 2016 Free Coaching Classes by Tamilnadu Government Announced. The free coaching classes for the TNPSC VAO Exam 2016 will be conducted in all District Employment Offices. Interested candidates to attend the free coaching can contact your District Employment Office in person. TNPSC VAO Exam One Day Free Orientation / Guidance Program by Periyar IAS Academy, Vepery, Chennai. The free TNPSC VAO Examination guidance session will be conducted on 25-12-2015 at 3pm. If you are new for the TNPSC Exams, it will be very useful for you. Interested VAO exam Aspirants can contact Periar IAS Academy through following contact number 99406-38537. Latest News: TNPSC VAO 2015 - 2016 Exam Date is postponed to 28th February 2016 . Tamilnadu Public Service Commission has announced the change of TNPSC VAO 2016 Exam Date to 28-02-2016. Previously, the Commission has informed in TNPSC VAO Exam 2015 - 2016 Notification that the exam date as 14th February 2015. Two days back, the last date to apply online was also extended from 14th December to 31st December 2015. Now the VAO Examination date also changed by TNPSC. TNPSC VAO Exam Last Date to Apply Online is extended to 31-12-2015. In TNPSC VAO original notification, the last date for VAO Online Application was mentioned as 14-12-2015. Now the TNPSC has changed the last date for online registration to 31-12-2015. If you have not applied till now, please apply soon from the TNPSC Official Websites www.tnpscexams.net or www.tnpsc.gov.in . Many friends asked 'will TNPSC change the TNPSC VAO Exam Date ?' . There is no official information regarding Change of TNPSC VAO Exam 2015 Date . We will update in this page if there any changes. 15-10-2015 : TNPSC New Chairman Dr. K. Arulmozhi. IAS has informed that TNPSC VAO Exam 2015 Notification for about 800 vacancies and TNPSC Group 4 Exam 2015 notifications will be published soon. We can expect the notification with in the month of November 2015. Read more. 12-10-2015 : TNPSC Group Two Non Interview Posts Exam 2015 notification was published for 1863+84 posts on 12th October 2015. So, we can expect the most awaited TNPSC VAO exam 2015 announcement for about 800 plus vacancies also to be published soon by the Tamilnadu Public Service Commission. All the best for tnpsc vao exam 2015 aspirants ! 07-09-2015 : TNPSC VAO 2015 Examination announcement to be published soon. Total number of vacancies will be about 800 - Tamil Nadu Public Service Commission Chairman informed. Dear all TNPSC Village Administrative Officer Exam Aspirants, most probably the VAO Exam notification and Group IV examination announcements are expected to be published with in the first week November 2015, so don't waste your valuable time, start your sincere preparation for Village Officer Exam from today itself. Since, the TNPSC Village Administrative Officer Exam questions will be asked in SSLC Standard, you may start your VAO Exam preparation with Tamilnadu Samacheer Kalvi 6th to 10th Science, Social Science text books for General Studies and 6th to 12th Tamil / English Books for Pothu Tamil or General English Portions. Concentrate more on Pothu Tamil / General English Portions. Specially concentrate very well on Basic of Village Administration portion, which covers nearly 25 questions of the total questions asked in the Village Administrative Officer Examination' General Studies Paper. Because, there is only about 800 plus vacancies in the upcoming VAO Exam notification. Prepare yourself to get your place in the VAO Exam 2015. All the best ! 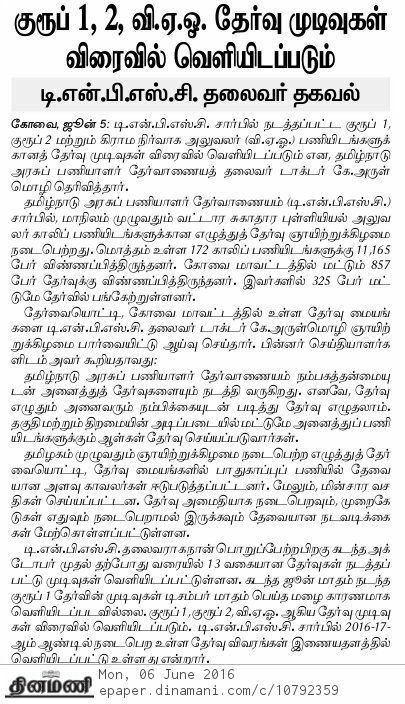 News source : Dinathanthi,7-9-15. 24-08-2015 : TNPSC VAO Exam Notification to be published in September 2015 - During a press meet today, the TNPSC Chairman (In-charge) has informed this important news about next VAO Exam notification date. Expected Number of total Vacancies in the upcoming TNPSC VAO Exam 2016 Notification will be nearly 800 plus posts. So, dear Village Officer Examination Aspirants, start your very sincere preparation from today itself. All the best ! 25-08-2015 : TNPSC VAO Counselling Latest News Updates - TNPSC Village Officer Exam 2014 Second Phase Counselling start on 2nd September 2015. TNPSC VAO Exam 2014 was held on 14-06-2014. The result for the same was published on 15-12-2015. There are about 600 Village Administrative Officer posts vacant in the end of previous counselling. Now the second phase counselling is also called for. The Village Administrative Officer Exam counselling will be held from 02-09-2015 to 11-09-2015 .The tentative list of candidates for second phase counselling is published in the TNPSC Official Website www.tnpsc.gov.in . 19-08-2015 : There is a latest news about TNPSC VAO Exam 2015 in Dinathanthi Newspaper Today. The news article says that TNPSC has not received the total number of posts for TNPSC VAO 2015 Exam and TNPSC Group 4 Exam 2015 from the relevant Government Departments. The notification for the both examinations are expected very soon after getting the full vacancy details from various government departments. 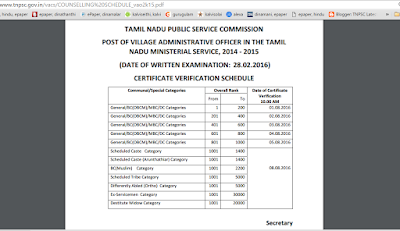 When will be TNPSC VAO 2015 Notification Published? Tamilnadu Public Service Commission (TNPSC) has Published Notification for the TNPSC Group 2 (Interview Posts Exam) 2015 and TNPSC Group 1 Exam 2015 . Among them TNPSC Group 2 Interview Post Preliminary Examination was successfully conducted by the TNPSC and Group One Exam 2015 is scheduled to be conducted in Novemeber 2015. So the next important recruitment announcement from the TNPSC may be TNPSC VAO 2015 Exam and TNPSC Group 2A Exam 2015. So start your sincere preparation from today itself. All the best ! According to TNPSC Annual Planner for the year 2015 - 16 published on 30-01-2015, the TNPSC VAO Exam 2015 notification is expected in the first week of July 2015. So start your TNPSC VAO Exam 2015 preparations from today itself. Start with school text books 6th to 10th std. and give more importance to Village Adminstration Related questions and Pothu Tamil / General English . The Annual Planner 2015-2016 gives tentative date for conducting VAO Exam 2015 as 04-10-2015. TNPSC Annual Planner 2015-2016 also mentioning tentatively that the TNPSC VAO Result date may be in the first week of December 2015. 28-07-2015 : Good news for all TNPSC VAO Exam 2014 Aspirants ! TNPSC VAO 2014 Second Phase Counselling list is expected to be announced soon by the TNPSC - The Hindu Tamil News Today (28/07/15). TNPSC VAO 2014 Exam was conducted on 14-06-2014 . The result was published on 15-12-2014 . Following that, first phase counselling was conducted in the month of February 2015. Now it is expected that the Second Phase VAO 2014 Counselling will be announced by the TNPSC Soon. All the best ! Dear VAO Examination Aspirants, this page is committed to provide all latest news updates about the upcoming TNPSC VAO Exam notification, exam date, result date, counselling dates etc. from TNPSC and all other newspaper news sources.